More than three thousand youth participated in a march for peace from Friday, June 8th to Sunday, June 10th. 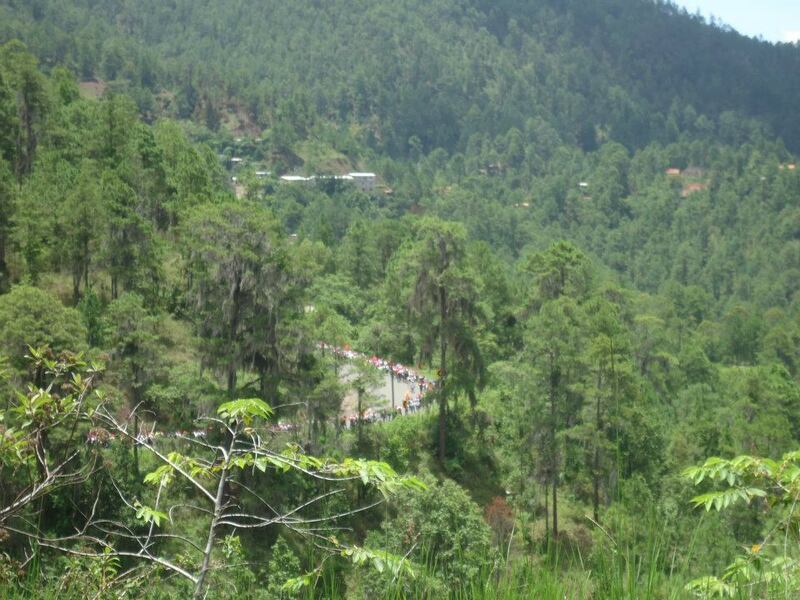 They arrived to Tegucigalpa, the capital city of Honduras, on Friday at 6:00 AM to start the 66 kilometers, 41mile march. Each parish had been preparing the event with reflections on the theme of the march: "Samaritanos por la Paz" (Samaritans for Peace). 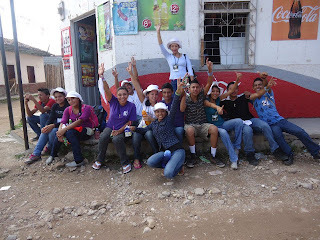 Fourteen young people from St. Rose of Lima Parish in Guaimaca participated, coordinated by Andrea López the Parish Youth Coordinator, and tutor at the Marie Poussepin Center (CMP). 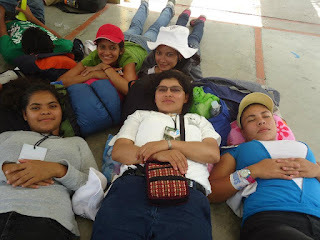 Sr. Gloribel Mendoza, who works with the parish youth and Mirna Carolina Trujillo, one of the CMP junior high school students who is discerning her vocation, were part of the Parish group. 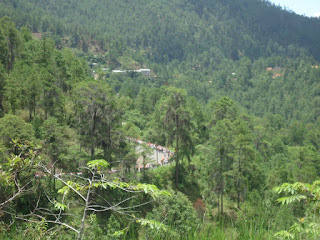 As it can be seeing in some of the pictures, the young people marched through winding mountain roads that took them to three towns: Valle de Angeles, Cantarranas and Talanga. It is known internationally that Honduras is a country where violence and crime have been increasing due in great part to drug traficking. In this context, to have so many young people marching, singing and praying for peace was a tremendous witness to many. Happily it was presented through the different media, both TV and newspapers. Of course, depending on their walking customs, there were some pilgrims who fainted or had swollen and blistered feet. In the case of the pilgrims from the CMP, Mirna Carolina is used to long walks to travel back and forth to the CMP from her village, Andrea, as a city young woman, was very tired and Sr. Gloribel was welcomed by the Community with a special wheel chair! 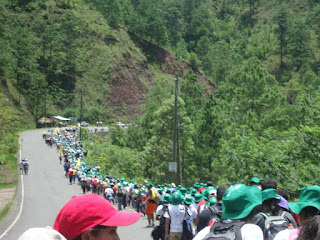 All together, for our three pilgrims it was a great opportunity to sacrifice for peace, to be part of a large effort to change our society and to act according to their values. 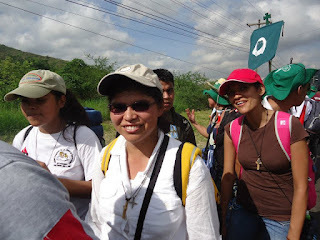 As coordinator of the Pilgrimage, Andrea was able to experience the Lord's presence and work throughout the journey... in faith she could see Him taking care of everyone! Sister Gloribel is in her second year of Nursing, which in Honduras means a whole year of practice at a health center. Happily she is able to do it right in Guaimaca. Her supervisor at the Health Center allows her to still work two days a week at the St. Rose of Lima Clinic with Sister María Ceballos. These past months have given Sister Gloribel a variety of experiences in many aspects of nursing: triaging and treating patients, record keeping, vaccination campaigns, etc. During the three weeks of the vaccination campaign, she saw herself vaccinating at the Health Center, in the villages, the different barrios or neighborhoods of the City of Guaimaca, and also at the Marie Poussepin Center. We can see Sister Gloribel visiting different homes. At the Marie Poussepin Center Sr. Gloribel vaccinated many of the younger students. also benefitted from the onsite vaccination. It is good t see Sr. Gloribel being more familiar witht he different aspects of healthcare. This is certainly a great asset to the community and to the mission!